When talking about .mobi, .doc or .docx files, we are referring to file types or extensions. (For example: filename.mobi) In some cases, your computer may not show the file extensions. In that case, it may be helpful to change your computer settings to allow it. Usually, a computer will at least show specific icons for each different file type to help you identify them. Here are some ways to obtain acceptable files for your book, if you do not already have them on your computer. 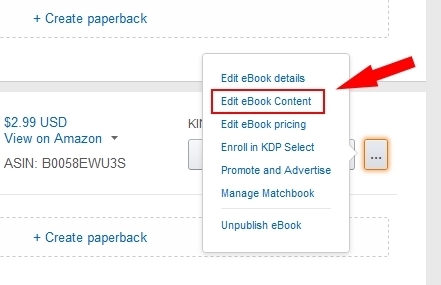 If you use Amazon’s KDP (Kindle Direct Publishing) you can download a Kindle MOBI file from there. Click on “Bookshelf” at the top. 3. Click the “…” Button. 5. Scroll down to the Kindle eBook Preview section. You can also download the HTML file for yourself if you wish. You can open it in Word then save it as a doc or docx. 2. Click on the book you need the file for. 3. Click the “mobi (Kindle)” button under Download the full version of his book. You can create a Word file by downloading the HTML file from KDP. (See KDP section above) You can then open it in Word then save it as a doc or docx. From Word, use the open icon or menu, browse to the location of the HTML file and open it. Save the file as a doc or docx file. If you had someone else edit the files or upload them to Amazon, Smashwords etc. then ask them to provide you with the files. It’s your book after all!